Prepare a double boiler and bring 6 to 8 quarts of salted water to a boil. 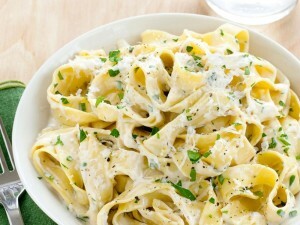 While the fettuccine boils ( note that Borgatti’s fresh fettuccine cooks in just 4 to 5 minutes; store­ bought dried pasta may take 11 to 12 minutes), carefully melt the butter in the top of the double boiler. Add the heavy cream and half of the parmesan cheese, whisking constantly. Drain the noodles and quickly toss them in a bowl with the hot sauce and the egg yolk. Mix rapidly so as to serve piping hot. Add the rest of the grated cheese and freshly ground pepper to individual portions, as desired.